Duchesse de la Motte Houdancourt. Anon. Sale, Christie's, London, 7 July 1943, lot 166. James O. Belden, Washington, D.C.. 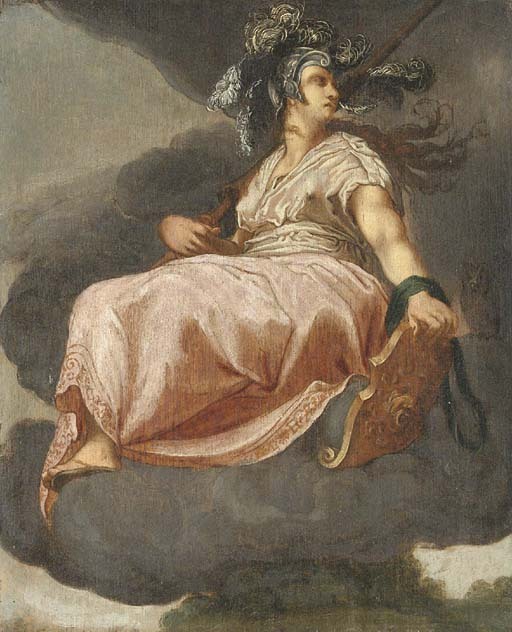 The present work depicting Minerva (Athena) recalls one of the four printed images of deities executed in 1596, probably by Goltzius, as part of a series. This was made up of three goddesses (Venus, Juno, and Minerva) and Hymenaeus, the Greek god of marriage. Bartsch ascribes the whole series to Saendredam (B. 62), but Hirschmann gives them to Hendrick Goltzius whose monogram appears on the images (H. 139). The series is dedicated to Johannes Barritius, privy councellor and secretary to the Emperor Rudolf II.